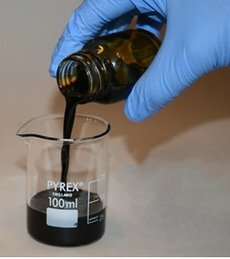 Researchers at Aarhus and Aalborg University in cooperation with the firm Steeper Energy Ltd. have developed a new and innovative process that can efficiently convert “all kinds” of biomass to bio-crude oil. Called HydroThermal Liquefaction (HTL), the process product is sufficiently similar to fossil crude oil that a simple thermal upgrade and existing refinery technology can be employed to subsequently obtain the most common petroleum fuels we know today. 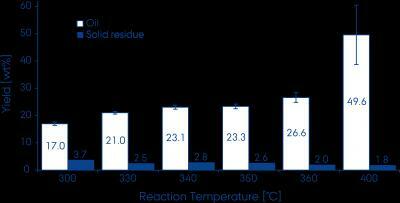 Thermal Biomass Composition Results by Process. Click image for the largest view. The HTL process is reported to only consume approximately 10-15 percent of the energy in the feedstock biomass thus yielding an energy efficiency of 85-90 percent. If this is accurate the thermal treatment of biomass is in for a major change. The paper has been published in the American Chemical Society journal Energy and Fuels. The Danish team is emphasizing the HTL process accepts all biomasses from modern society – sewage sludge, manure, wood, compost and plant material along with waste from households, meat factories, dairy production and similar industries. That would make HTL by far the most feedstock flexible of any liquid fuel producing process, including pyrolysis, bio-ethanol, gasification with Fischer-Tropsch or catalytic upgrading of different vegetable or agro-industrial residual oils. The team’s believes their new process will operate at a lower cost than all of the other technologies in research or operation today. It’s looking like a big claim. 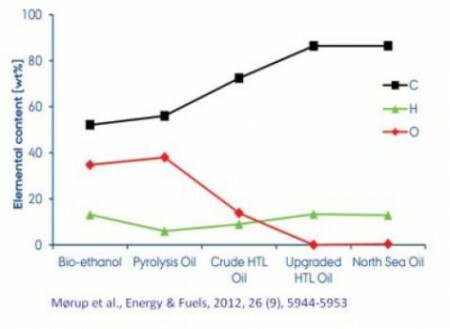 This graph shows oil yield from HTL at different temperatures according to a recent study done by Aarhus University. Image Credit: Mørup et al. Technically, hydrothermal liquefaction is basically pressure cooking, but instead of cooking the biomass in batches, one pot-full at a time, this new generation of HTL is based on flow production, where the biomass is injected into a 400°C (752ºF) pre-heated reactor, “cooked” under high pressure for ~15 minutes and then quickly cooled down to 70°C (158ºF). At 400°C and high pressure the water is in a supercritical state, neither liquid nor gas, so it easily decomposes the biomass. The process is environmentally friendly, since no harmful solvents are involved, and the energy efficiency is very high: The HTL process only consumes approximately 10-15% of the energy in the feedstock biomass. The heat energy is also recycled between the heating and cooling of the process medium. Upgraded HTL bio-oil, fresh from the small reactor at Aarhus University. Image Credit: Aref Mamakhel, Department of Chemistry, University of Aarhus. The wet medium means that HTL readily accepts moist or wet biomasses, such as those mentioned above. Wet biomasses are the vast majority of the resources available. All other known processes for liquid bio-fuel production either require expensive drying or only make use of a limited proportion of the biomass, e.g. the carbohydrate content. A process avoiding the problems of obtaining critical moisture composition is a huge savings in equipment, time, energy and storage. The water phase coming out from the HTL process has low carbon content and can either be recycled into the process as needed or ultimately be purified to any water quality an operator might choose including drinking water levels, which is the team’s long-term goal. As such HTL replaces the burden of water disposal with the benefit of recycling the water or making use of it. · HTL oil is storage stable, and has comparatively low upgrading requirements, due in part to a high fraction of middle distillates in the crude oil. It is much less upgrading intensive than e.g. pyrolysis oil, which needs immediate upgrading in order not to deteriorate. The bio-oil from HTL can be used right out of the reactor in heavy engines or it can be hydrogenated or thermally upgraded to obtain diesel, gasoline or jet fuels by existing refinery technology. 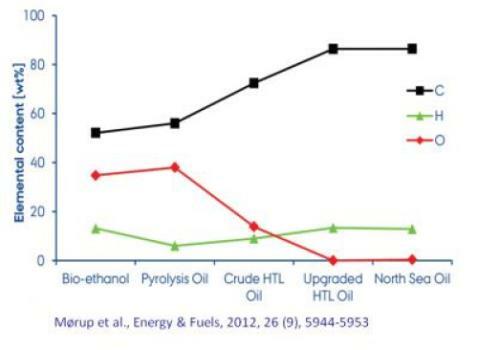 In that sense, HTL bio-oil is directly comparable to fossil crude oil. This is unique among liquid bio-fuels and means that it can directly enter the existing fuel distribution network for automotive transportation in any concentration, giving it full drop-in properties. The Danish universities Aarhus University and Aalborg University are in partnership on HTL research at all levels. At Aarhus, the Dept. of Chemistry focuses on fundamental understanding of the process and quick surveys of the effects of different feedstocks and catalysts along with subsequent upgrading. The Dept. of Agro-Ecology develops energy crops while Dept. of Engineering works on pilot-scale HTL. The energy crop research is pursued even more vigorously at Aalborg University’s Dept. of Energy Technology, which focuses strongly on pilot-scale production and process efficiency, as well as upgrading of HTL bio-oil along with end user testing of oils and upgraded distillates in engines and turbines. The Dept. of Biotechnology, Chemistry and Environmental Engineering, AAU Esbjerg, directs its activities towards extracting value not only from the oil, but also from the effluents. Which raises the unanswered question on the remains coming from a reactor. One wouldn’t expect a lot of remnant, but what would come out would be mineral rich and perhaps rather chemically complex. Still, there will be considerable value involved and the Danes seem to know it and are working on it. The Danes are pretty motivated. They hope to take these results and surpass their earlier massive success in the early wind energy efforts of the 1980s. We all wish them great success. I wonder if an oil algae feedstock would make this process more efficient with higher oil outputs? Or, would it unnessesary overhead? This process isn’t realy all that new. I believe it is either a recycled effort of the now defunct company ‘CWT’, whose process was called “Thermal Depolymerization”, or accidental clone. They had a plant in Carthage, Missouri processing turkey waste into 500 barrels a day of bio-crude, but people nearby complained of the smell, and after repeated legal attacks, the plant was closed. I’m not sure if the process was economic or not, as the legal battles interfered with the normal development of the technology.